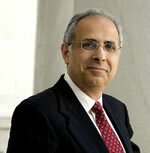 John Zogby sat as Chairman of the Board and Chief Insights Officer of IBOPE Zogby International. He was formerly founder, President and CEO of Zogby International. In 2008, John Zogby authored The Way We’ll Be: The Zogby Report on the Transformation of the American Dream. His analytical expertise has also been published on the opinion pages of the New York Times, Wall Street Journal, Financial Times, Christian Science Monitor, Philadelphia Inquirer, Newsday and Boston Globe. He is a founding contributor to the popular website, The Huffington Post, and currently writes a weekly column for Forbes.com and a monthly column for Campaigns & Elections magazine. The New Yorker, Fortune Magazine, Investors’ Business Daily and Inc. have all profiled John Zogby. He is a well-respected, popular lecturer and panelist who has appeared on all four major U.S. television networks, and dozens of U.S. and international cable news programs. Spoofs of John Zogby can be heard on National Public Radio’s All Things Considered, The Tonight Show with Jay Leno, and the Late Show with David Letterman. Among his favorite appearances are his interviews on The Daily Show with Jon Stewart. Currently, John Zogby is a Senior Advisor at the Kennedy School of Government at Harvard University and serves as the first-ever Senior Fellow of the Catholic University Life Cycle Institute. He also serves as a Commissioner for the Center for Strategic and International Studies (CSIS) Commission on Smart power, having previously served as a member of Congress’ Advisory Commission on Public Diplomacy. John Zogby holds degrees in history from Le Moyne College and Syracuse University. He holds honorary doctorate degrees from State University of New York at Albany, St. Rose College, and the Graduate School of Union University. He was a member of the Board of Trustees of Le Moyne College, from which he received the distinguished Alumni Award. He is Chairman of Sudan Sunrise, an organization dedicated to fulfilling the promise by NBA legend Manute Bol to build elementary schools in his native country. He is a member of the Advisory Board of the national Council for International Visitors and Upstate (NY) Venture Connect.